The possibilities are “literally” endless in the Matterhorn swim spa. Indulge yourself in this sleek and elegant unit that has all the hydrotherapy benefits of a top of the line hot tub, but that also allows you to enjoy year round swimming and aquatic exercise. 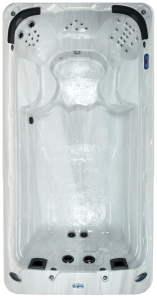 The Matterhorn boasts a sturdy steal frame, solid 1/2” ABS bottom and angle iron bracing throughout the acrylic shell. However, the Matterhorn is not only brawn but beauty as well. With seating for six, large entry steps on both sides and multiple cabinet and acrylic colors you can rest easy knowing you have purchased a quality product to enjoy through the years. 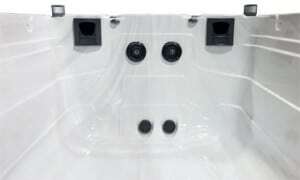 Contact us to learn more about our swim spa selection, hot tubs, and spas. ALPS 4000 deluxe control with dual 5.5 kw heater (11 kw total). Fill weight: 19,500Lbs. / 8,864Kgs.